Last week we looked at some concept art for Hollywood Boulevard in Disney-MGM Studios. Today, let’s take it one step further and look at an aerial view of the park’s construction in July of 1988. There’s not much to go on here, but note that the opening scene, Hollywood Boulevard, had plenty of space and no side street of Sunset Boulevard, as that area was still years away. Although, it is worth noticing that there is ample amounts of land there ready for a second phase project. 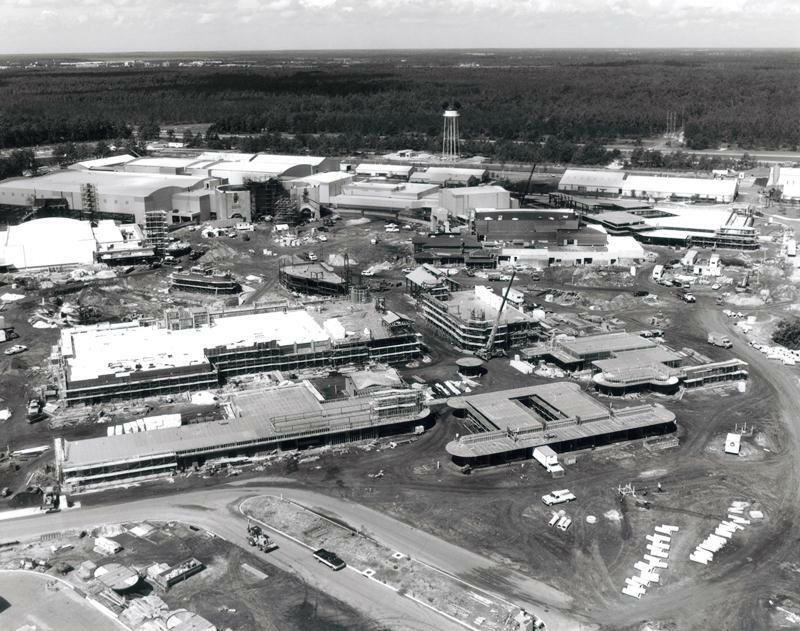 Many of the soundstages for film, television, and animation are either completed or in the final stages of construction. This is due in large part to the need to have finished productions, such as The Lottery, when the park opened in May of 1989. Echo Lake is beginning to be carved out. The Brown Derby is looking fabulous, even though it is not yet finished. The Chinese Theater is beginning to take shape, as is the entrance and parking areas. Towering above it all, the standard-bearer as it were, is the Earffel Tower. Even early on in the project’s construction, there is still so much to be gleamed about the future of Walt Disney World’s third park.